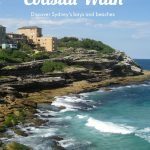 The Bondi to Coogee walk is one of Sydney’s most popular coastal walks. With breathtaking views, little bays and fabulous beaches, this is one walk not to be missed. 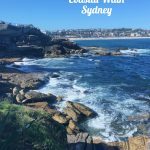 One of my favourite things to do in Sydney is the Bondi to Coogee walk (or the Coogee to Bondi walk). In fact, when friends ask me for recommendations of what to do in Sydney, it’s one of the first things I suggest. It’s a must do on a visit to Sydney. I do a little twist on it though and do the walk in reverse going from Coogee to Bondi but more on that later. Type: Moderate – wear comfy shoes! Don’t let the thought of 6k put you off! It’s not as bad as it sounds. You’ll be so busy taking in the views you won’t notice the distance. The walk should take around three hours at a leisurely pace. However, I’d plan for half a day or even a full day. You’ll want plenty of time to appreciate the views of the coast, stop for a drink or to hang out at one of the beaches. It is a fairly easy to moderate walk although there are some stairs and a few steep inclines. Unfortunately, the walk itself is not very accessible. I think it would be a challenge with prams and buggies too so bear that in mind if you have little ones. However, the beaches at Bondi and Bronte are fully accessible for wheelchairs and prams. 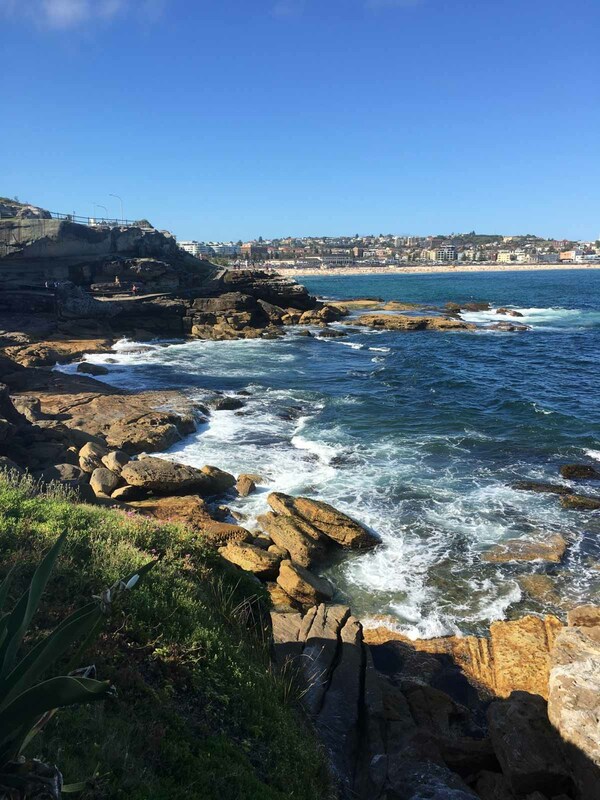 While doing some research on other options I found a great blog – Have Wheelchair Will Travel – with an alternative option for a coastal walk at Coogee. Which direction should you do the walk? You can do the walk in either direction although Bondi to Coogee is probably the more popular route. So if you do it this way you’ll be going in the same direction as most of the foot traffic. 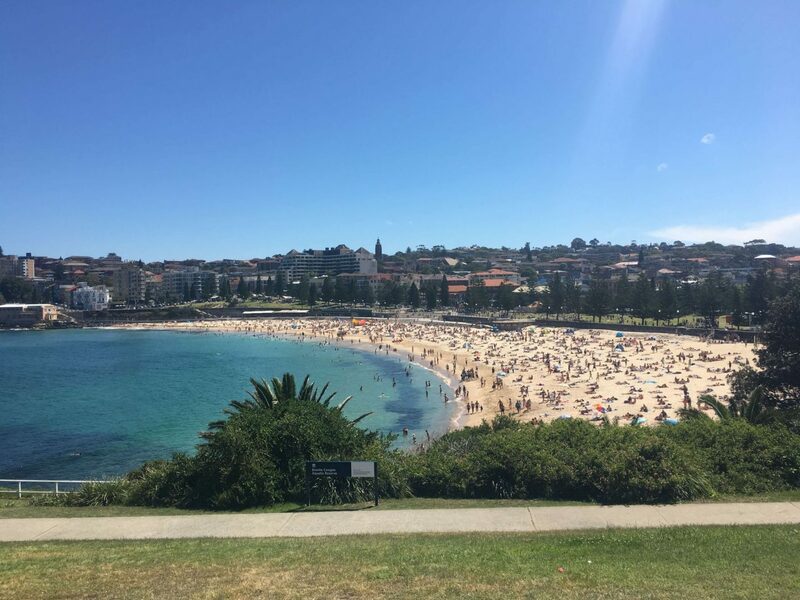 I usually walk from Coogee to Bondi as I prefer to spend time in Coogee first – it’s a much nicer beach. Sorry Bondi fans! Another advantage of doing in reverse is that you get a great first view of Bondi Beach when you walk around the final headland. 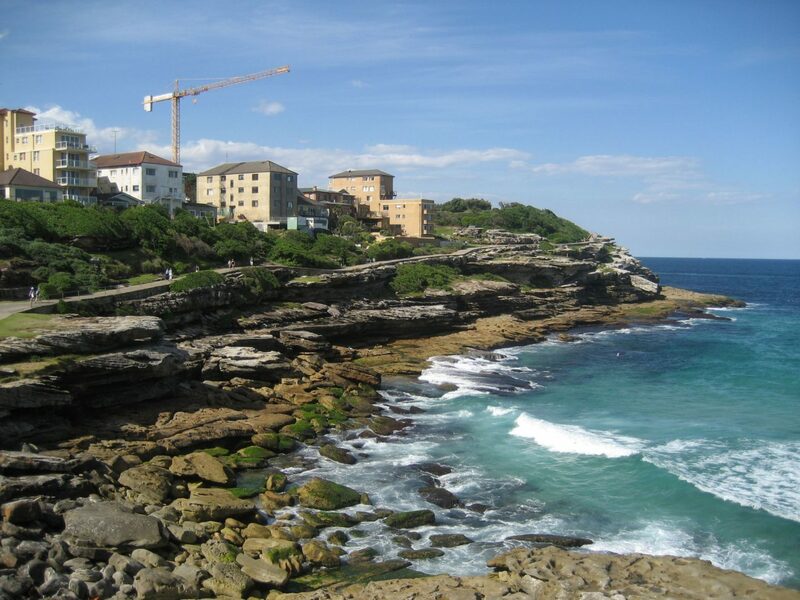 Whichever way you walk between Bondi and Coogee you’ll still see the same stunning coastal views. As always with Australia keep the weather in mind. You will be exposed to the elements so don’t forget the sunscreen. It can get a little breezy too so depending on the season pack a light jacket/cardigan and comfy shoes are a must! Spare batteries for your camera or portable charger for your phone – you’ll be taking plenty of photos. 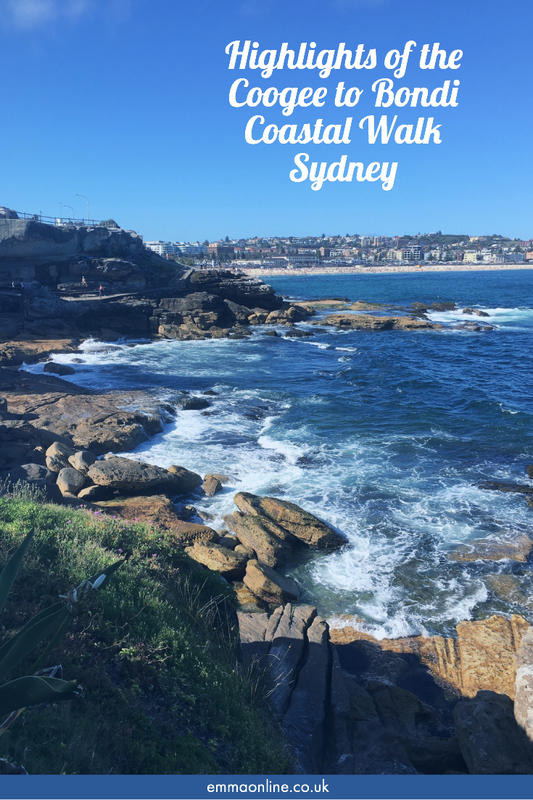 What will you see on the Bondi to Coogee Walk? The walk is an ideal way to discover some of Sydney’s nicest beaches. You’ll see some stunning coastal views, small bays, sandy beaches, parks and ocean rock pools. There is also plenty of places to stop for a snack or drinks and take in the views. The walk starts at the world famous Bondi Beach. If it’s your first time in Sydney, you have to go here. You can’t not. There are much nicer beaches in Sydney but none quite as iconic. Just saying Bondi conjures up images of a huge sandy beach with sparkling blue waves lapping the shore and surfers riding the waves. Unfortunately, it’s not usually quite like that. With such a reputation it is inevitably very crowded at times. In the height of summer, you’ll be lucky to find a spot to lay your towel down. However, don’t let that put you off spending a little time there. There are plenty of cafes along Campbell Parade to soak up the atmosphere in or you can stroll between the two headlands the beach is bordered by. If you are looking for something a little more glamorous, head to Bondi Icebergs at the southern end of the beach. Here you can take a dip in the famous Bondi Baths or fuel up for the walk at the Icebergs Club Bistro. Once ready to start the walk you can pick up the coastal path from Notts Avenue, near Bondi Icebergs. It’s a short walk until you reach the headland. Don’t forget to look back here, you’ll get a great panoramic view of Bondi. The first beach you’ll come across on the walk is Tamarama beach. Nicknamed Glamarama, apparently because it’s where the beautiful people like to be seen, Tamarama Beach is nestled between two headlands. With its golden sand and turquoise waters, it’s hard to believe that this small beach is the most dangerous patrolled beach in New South Wales. It is often closed to swimmers so if you visit and want to swim, check it is safe to enter the water before doing so. This family-friendly beach has something for everyone. A beautiful sandy beach, a natural rock pool, a large park and picnic area (with barbecues). It can get busy here but it’s not usually as crowded as Bondi. This is a good spot to take a break during the walk. The Bronte Beach Kiosk, between the beach and parkland, offers a range of snacks, smoothies, ice cream or coffee. 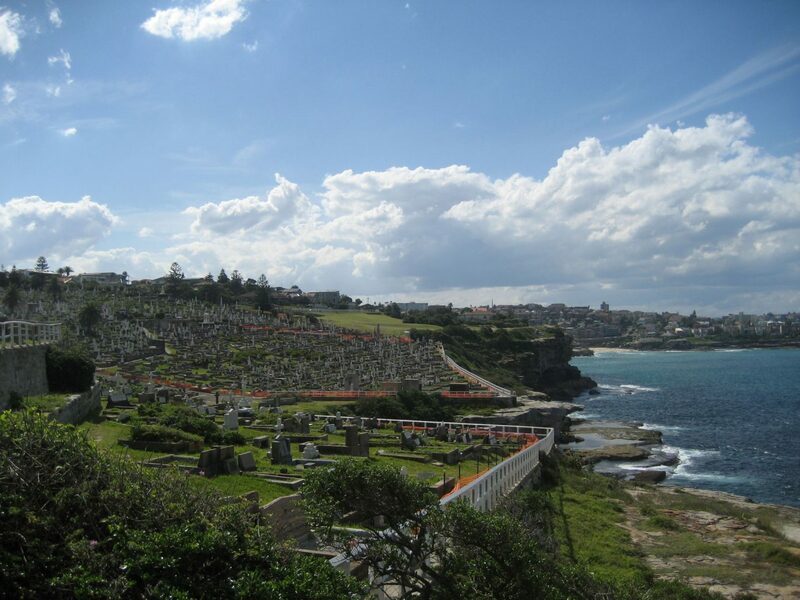 Perched on top of the cliffs at Bronte, this heritage listed cemetery is often referred to as one of the most beautiful cemeteries in the world. In 2016 a storm caused a landslip with part of the walk’s boardwalk being swept away. The walk now diverts through the cemetery giving you a chance to take a closer look at the Victorian and Edwardian monuments. Many notable Australians are buried here and the cemetery offers tours if you would like to find out more about their history. 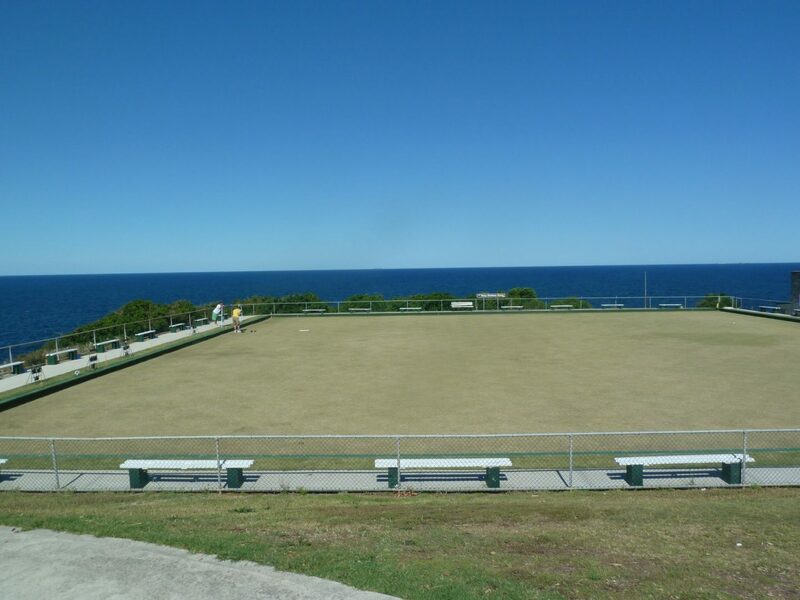 This club must have the best view of any Lawn Bowls Club in the world. I’m not sure how you’d even play, it must be so distracting! If you’ve never played bowls before, pop in and they’ll teach you for just $15. Just keep your eyes on the green and not the view! Take a look at their site for more information. 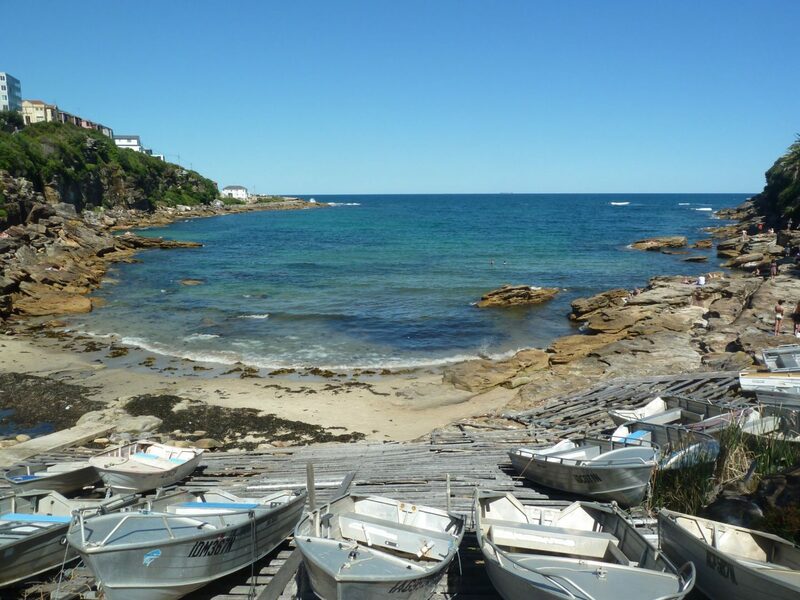 The next bay is Clovelly, one of Sydney’s more unusual beaches. This narrow bay is bordered on either side by concrete platforms which aren’t actually as bad as they sound. It’s a great spot to sunbathe and you won’t get sand in places you never knew sand could reach! There is a beach (if concrete isn’t your thing), a park and a saltwater pool with swimming lanes making it popular with families. There are also a few facilities here including a beachfront café and public changing rooms. If the walk is not strenuous enough for you on the next headland is the Clovelly Beach outside gym. Here you’ll find 13 pieces of exercise equipment so you can stop for a quick workout! Continuing along the path you reach Gordon’s Bay. 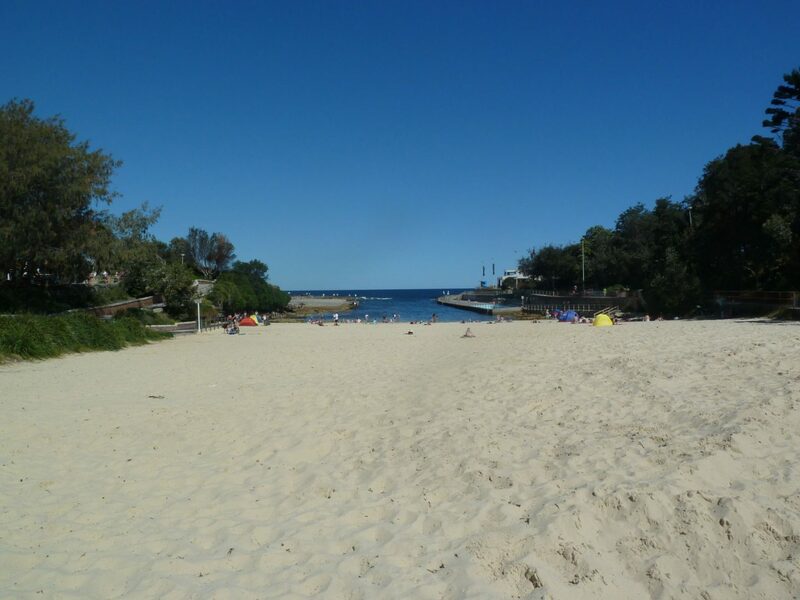 With its small beach and secluded feel, it’s one of Sydney’s (not so secret) secret beaches. While the beach is tiny, this is a great place to snorkel. You can even do a self-guided underwater nature trail. It’s also a great spot for a photo so if you are looking that perfect Instagram shot, you’ll find it here. It’s almost the end of the walk but before you reach Coogee there is one more beauty spot to enjoy -Dunningham Reserve. 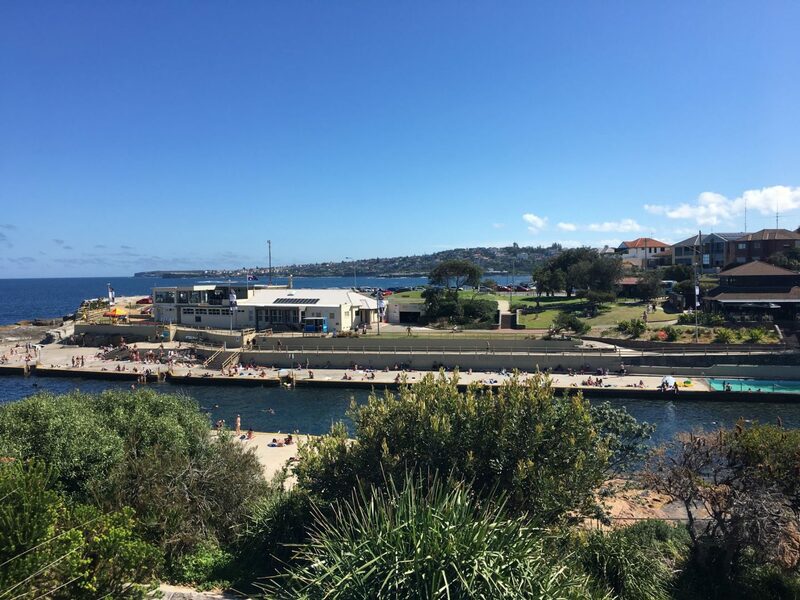 The coastal path runs along the edge of the reserve and gives you sweeping views over Coogee beach and the ocean. You’ll definitely want to stop here for a few photos. While you are there look out for the memorial to the victims of the 2002 Bali bombings. The bronze sculpture is made up of three linked figures that represent family, friends and community. The end (or maybe start!) of the walk. Coogee Beach is one of the best beaches in Sydney. It was my local beach when I first stayed in Sydney so it will always have a special place in my heart (ok, I’m a bit biased). It was a firm favourite with backpackers back then but don’t let that put you off! You’ll be spoilt for choice for cafes so plan in some time to have an alfresco brunch and a drink while soaking up the laid-back beach vibe. No time to do the full walk? If you don’t have time to do the full 6k walk but don’t want to miss out, the walk can be split into sections. 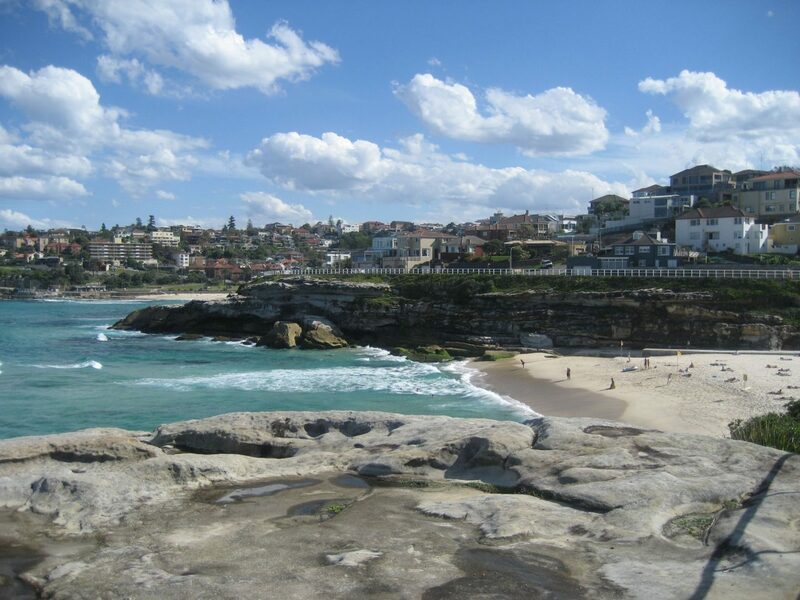 The Bondi to Bronte part is 4 km (3.5 miles) and takes around 1 ½ hours. 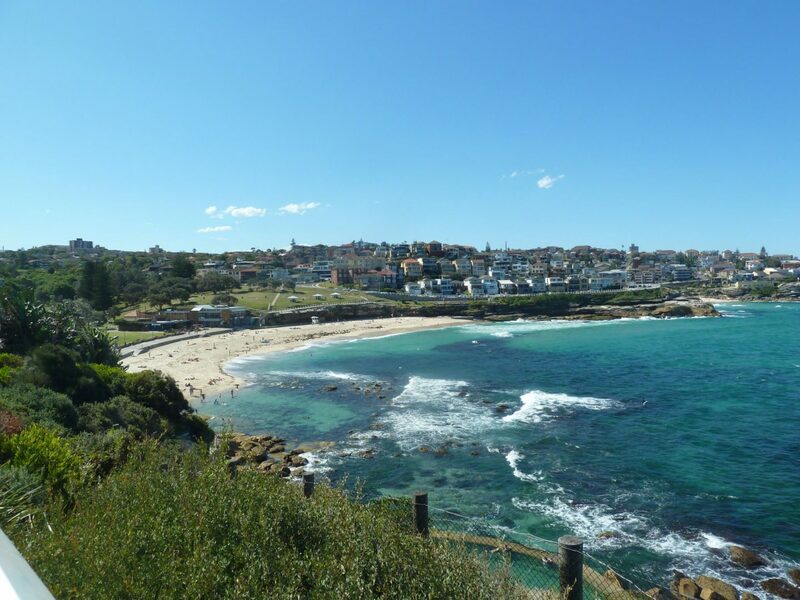 This section of the walk takes in three of Sydney’s beaches – Bondi, Tamarama and Bronte. So although you won’t get the full experience you’ll still see some spectacular coastal scenery. A free public exhibition, Sculpture by the Sea, takes place each spring (late October/early November) on the coastal walk between Bondi and Tamarama. Over 100 sculptures by Australian and international artists are on display for three weeks. It is the largest annual sculpture exhibition in the world. So if your trip coincides, make sure you build some time into your walk to explore the exhibition. Find out more about Sculpture by the Sea. To get to Bondi take the train to Bondi Junction. Then head to the bus centre and jump on a bus to the beach. In reverse, take the bus from the promenade (you’ll see the crowds) to Bondi Junction and jump on a train to the CBD. You can also get a bus from Bondi to the CBD but the train is usually a little quicker. To get to and from Coogee take the 373 bus which runs between Coogee and Circular Quay. For more ideas of things you can do in Sydney, view my post on how to see the best of the city in just a few days. This entry was posted in Australia and tagged Sydney.